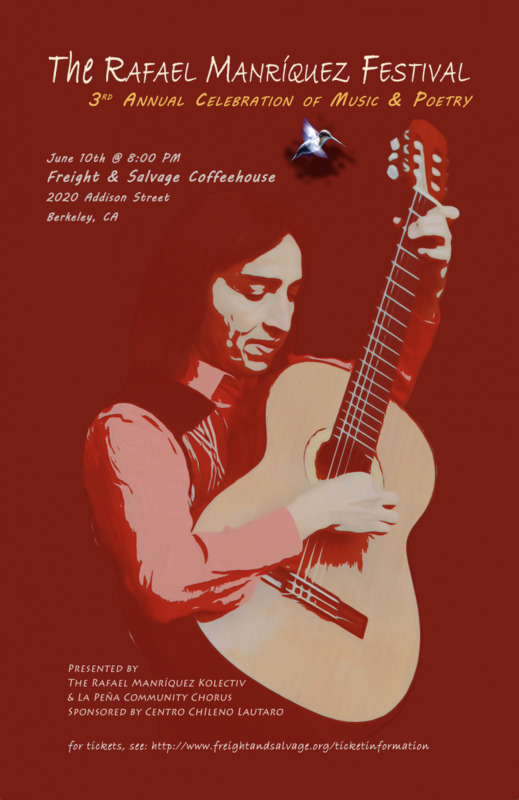 The Rafael Manríquez Annual Festival, will be the 3rd celebration of Latin American music and poetry organized to feature Rafael’s compositions in the hands and voices of a talented line up of multi-generational musicians on June 10th, 2017 at 8:00 PM at the Freight and Salvage Coffeehouse in Berkeley, California. This year’s program features a subset of up and coming San Francisco band Soltron, a Soltron Sextet whose members are: Daniel Riera, Roque Baron, Adriana Marrero, Manolo Davila, Ahkeel Mestayer and Ruben Sandoval. Soltron is a part of the rich arts community of San Francisco’s Mission District. Their sound echoes the traditions of the Afro-Latino musical diaspora while artfully blending electronic, hip-hop and rock influences. Joining the lineup is Professor David Spener, who has focused his attention on our songs of social justice authoring books such as We Shall Not Be Moved/ No nos moverán: Biography of a song of struggle and Canto de las estrellas: Un homenaje a Víctor Jara, while remaining a dedicated teacher at Trinity College in San Antonio, Texas and performer whose renditions of the music of Phil Ochs and Victor Jara inspire and release our dreams into the world. Aileen Vance, a Bay Area favorite will also be there to add her incredible rapport with audiences. Her connection is instantaneous and makes for serious yet light-hearted singing. In her words "I'm a great believer in songs about ordinary people," she says, "because I find so much inspiration in how people survive and flourish against all the odds. Maybe that's why I love performing so much in front of so many kinds of people: I simply find people amazing." Professor Carlos Baron of San Francisco State University, a professional actor and story-teller whom we are honored to announce as host and MC of the event with his deep bass timbre. He will also join us in singing a tune or two in Rafael’s honor and of course weaving our evening together with his anecdotes and pithy intros. Marci Manriquez as a part of the Rafael Manríquez Kolectiv is the drive behind this festival and will be adding her take on Rafael’s tunes and some of her own creation to the evening accompanied by incredible Florida based guitarist Dan Voll, her husband, arranger and rhythm guitarist Ricardo Valdivieso and Juan Carlos Morales as lead percussionist. Daughters Camila, Morgan and Danielle Valdivieso will join as singers to continue the family tradition. La Peña Community Chorus will lend their voices to music arranged by Rafael and bring the spirit of peace, justice, diversity and hope during this national time of intolerance. Started by the Chilean exile community who founded La Peña Cultural Center in Berkeley in 1975, the original mission of the Chorus was one of solidarity with the resistance against the dictatorship in Chile. Over the years their focus has expanded to other countries, including the struggles of people in El Salvador, Nicaragua, Mexico, Cuba, and to various labor, community, and women’s struggles closer to home. A second printing of Rafael’s bilingual book, Una cancion de esperanza andariega/ A Wandering Song of Hope will be available at the Festival. We are in conversations with Bay Area poets to have them read from this collection at the event. Rafael was a tireless cultural worker, composer, and renowned interpreter of Latin American music. He was a virtuoso vocalist and instrumentalist, playing multiple styles on the guitar, charango, cuatro, and tiple. Rafael’s music is deeply rooted in his native Chile, while drawing inspiration from the rich and varied folkloric traditions from all over the Americas. His lyrics are finely crafted stories and poems illustrating the beauty, customs, people, struggles, and hopes of Latin America. Rafael had the ability to profoundly touch people with his performances, the once music man of La Peña Cultural Center in Berkeley, founder of Grupo Raíz and founder of the La Peña Community Chorus, Rafael lives on in our songs and poetry. This concert is part of an ongoing campaign to archive, record, and distribute his vast body of work, and ensure the continued production of The Rafael Manríquez Annual Festival and a recognition of talented musicians and colleagues in the Bay Area.